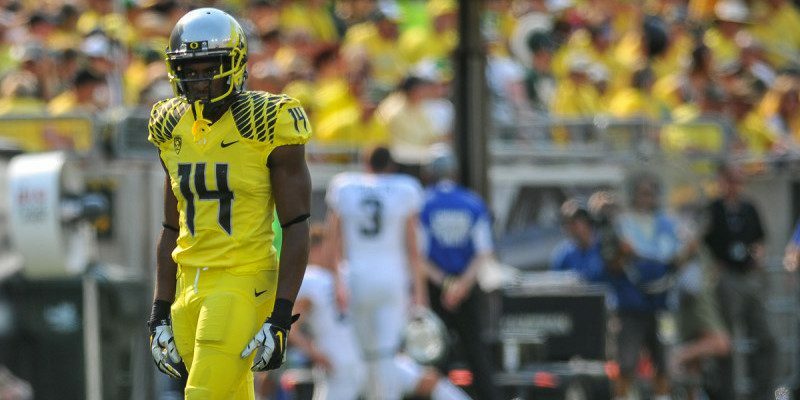 One of the Oregon players who’s gotten lost in the shuffle leading up to the NFL draft is Ifo Ekpre-Olomu. Perhaps it’s just the shadow of Marcus Mariota, or his own knee injury rehab, or maybe the fact that Ekpre-Olomu isn’t the 6’3” + CB that everyone is looking for in the NFL now. The thing is though, while everyone is looking for the giant CBs to go against the big and tall WRs of teams such as the Atlanta Falcons and Carolina Panthers, teams like the Seattle Seahawks are learning that giant physical corners don’t match well against small quick WRs such as Julian Edelman or Danny Amendola. Ekpre-Olomu has the ball skills to jump quick passes and create turnovers. This is why Ekpre-Olomu would be a great fit and a steal for any of the teams that are trying to do the whole “big, tough CB thing.” This is because Ekpre-Olomu is very much a tough and scrappy CB but because of being smaller and faster, he is more ready to go up against quick slot receivers. On top of his speed and quickness Ekpre-Olomu has the ball skills to jump the quick routes that are usually thrown to slot receivers as hot routes, potentially resulting in a lot of turnovers for his defense. Because of this skill set, his best fit would be for teams that have that size and toughness on the outside but don’t have a quick and speedy nickelback. The first team that immediately comes to mind is the Seahawks, of course. The ‘Hawks have Richard Sherman (6’3”), Carrie Williams (6’1”) and Simon Tharold (6’2”), giving them a good corps of big physical corners. 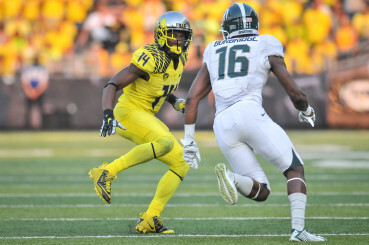 Ifo has the quickness needed to cover the quickest NFL slot receivers. Along with the ‘Hawks, the Philadelphia Eagles also would make sense, since after picking up Byron Maxwell from the Seahawks they have some size on the outside and are trying to get better production from that position. Plus, in the NFC East division they need someone who can cover quick and fast receivers, having to play Victor Cruz and DeSean Jackson twice a year. On top of this, there is the obvious Chip Kelly connection to make this draft make sense. Along with these two teams, Ekpre-Olomu would make a lot of sense for the New Orleans Saints as well, as the Saints have been building up their secondary to be imitate Seattle’s. The Saints two projected starters are veterans Keenan Lewis (6’1”) and Brandon Browner (6’3”); along with these two the Saints have talented second year CBs Stanley Jean-Baptiste (6’3”) and Brian Dixon (6’0”). The only reason they might not need Ekpre-Olomu as much as the other teams is that the three teams in the Saints’ division (Tampa Bay Buccaneers, Falcons, and Panthers) all have almost exclusively giants playing WR, with very little in the way of small, quick receivers. 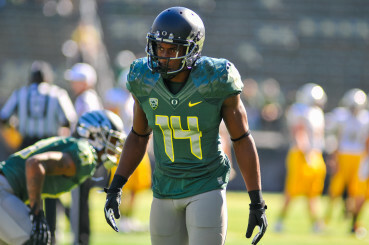 Ifo is a seriously tough dude. Regardless of who takes him, Ekpre-Olomu will be a steal as a late 1st-round to mid 2nd-round pick, assuming he comes back from his knee injury and that it doesn’t become a nagging issue. 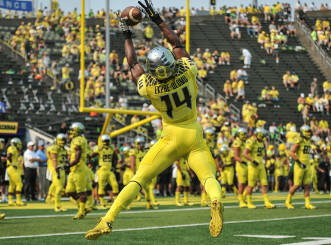 Ekpre-Olomu could be a good fit for any NFL team that needs help at corner, but he would excel and help the ‘Hawks, Eagles, and Saints. The NFL teams will be shocked by Ekpre-Olomu’s toughness and grit once he gets into the league, but they really shouldn’t be surprised, because any man who can go through the kind of injury and rehab he is going through has already proven his grit — and then some.